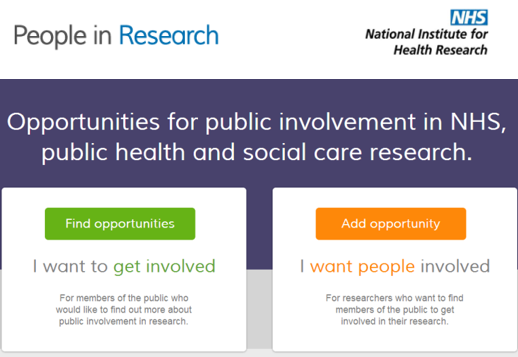 The People in Research website helps research organisations and researchers find members of the public to get actively involved in their work by enabling them to advertise their opportunities. Members of the public can search the opportunities database to see if there are any research involvement opportunities that they are interested in getting involved in. The website was redesigned in 2014. An advisory group comprising of members of the public and public involvement leads from research organisations were involved throughout this process. If you would like further information about the website please do contact us by email involve@nihr.ac.uk or telephone 02380 595628.